Hello my friends! I've been a busy teacher bee this week, subbing all over the place in my town. I am so happy to get some work! In between gigs, I was able to make a few clean-and-simple spring cards to share with you today. What made these particularly easy is that the floral/leaf die cuts were already in my Scrap Boxes, just waiting to be paired together. 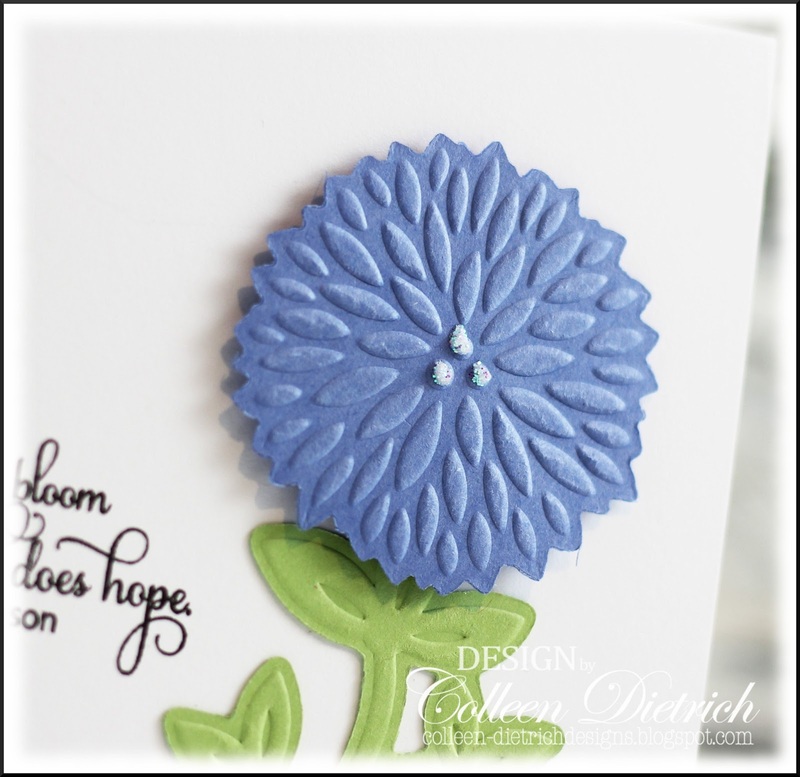 All I needed was a fabulous sentiment to create this set of cards, and I used one from Flowers Bloom by Inspired By Stamping. Each flower got a touch of iridescent glitter glue. Just a smidgen. I'm glad I had several of these chrysanthemum die cuts on hand, and they came in different colors: deep plum, periwinkle, and lilac. Thanks for letting me share my stuff with you today! I hope you are doing well in your little corner of the world. :-) I hope to do some blog visiting soon. Pretty CAS cards! Looks like you are LOVING your new crafty space! The sentiment is lovely and the flowers are very colorful. We appreciate seeing what you have created and posted with us. These are gorgeous!! LOVING the colors and the flowers!!!! Beautiful card! 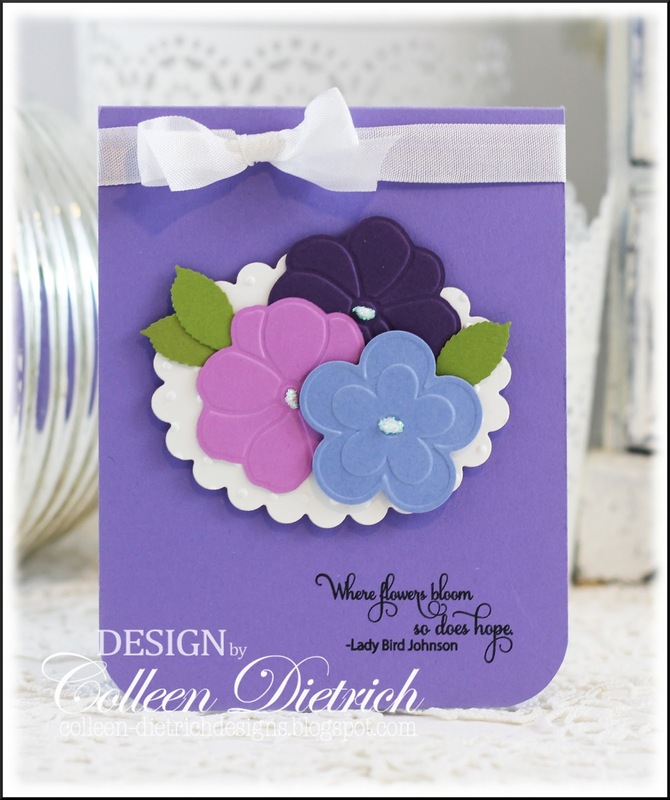 love the embossed flowers and gorgeous shades of purples and blues! Thanks for joining us for the Simon Says Stamp Challenge! These are wonderful Colleen, love your pretty flowers and sentiments! 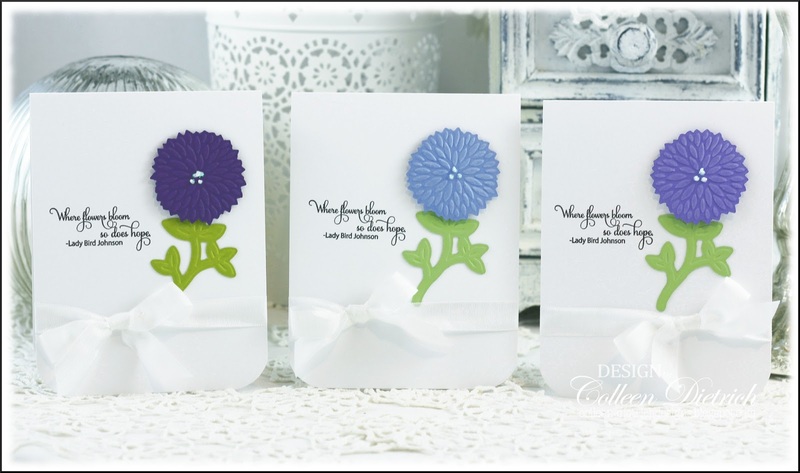 wow gorgeous cards.. loving all the fun flowers..
Loving the embossed flowers!! Great cards. Beautiful cards, Colleen. I especially love the embossed flowers and stems. Beautiful die cuts and the font on that sentiment is sooooo pretty. Love the purple base on the first card. Glad you're getting in some time with a job. Hi Colleen: I just LOVE the gorgeous shades of purple - they really look amazing. I also happen to love Lady Bird Johnson (one of the classiest First Ladies of all time). Thanks for sharing your gorgeous art with us this week. Have a blessed week and please come back to join us again soon. What a gorgeous collection of cards, Colleen! Love those die cuts and sweet sentiment! So inspiring and lovely! Have a wonderful weekend, hugs! Isn't it fun to dig into those scrap boxes and make some really pretty cards! Glad you're busy in a good way but still find time to craft! Hope all of you are well. These are beautiful, Colleen. I love the clean lines of your designs. Blessings! Lady Bird was a woman after my own heart with her campaign to beautify the country. You've brought a little spot of beauty to my living room today with these pretties. Love them both!